What are the patterns of RV enlargement in various clinical entities ? Right ventricle is a passive venous component of the heart .It simply acts a transit pump for blood to reach the lungs. It is true , RV is dispensable in many complex congenital heart disease as we can connect the great veins directly into the pulmonary artery by Fontan , Glean and it’s clones bye passing this chamber . Still , by no means the importance of this chamber is to be underestimated. RV dysfunction and failure is the key to survival many disorders.RV shock is is cause of sudden cardiac death in acute pulmonary embolism and RV infarction . RV is an unique muscular chamber .It is more of a triangular shape. It has three different parts connected by three different angle .There is no true apex for RV , it is connected to Inflow and outflow in peculiar fashion . 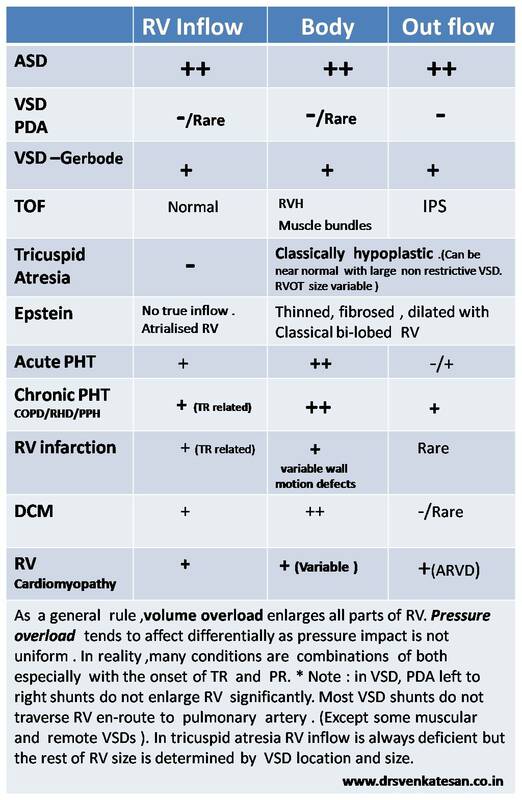 In the following table I have tired to describe of how different parts of RV behave in various disorders.